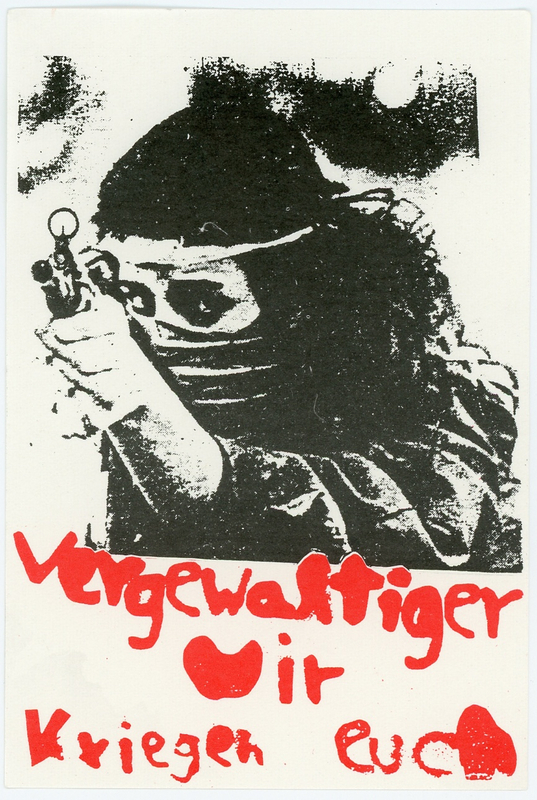 This “spuckie” sticker from the 1970s features a black and white graphic portrait of a militant woman holding up a gun to the viewer with a scarf that covers her face. Spuckies are small, handmade stickers made from lightweight paper that are stuck onto a surface by licking the back rather than using an adhesive backing like most modern stickers. The lack of complex or expensive materials provided an easy alternative to other methods of sticker making. The woman featured on this sticker was a popular image from the 1970s and is still seen today in stickers, prints, stencils, and wheatpastes. The image juxtaposed with the text addresses the issue of sexual assault and provides a contrast to the plethora of passive representations of women.